Like most economic activities these days, global food production is geared for profit and not for human well-being. Non-organic meat and dairy products contain most of the pesticides and herbicides that get into the human body because these chemicals are concentrated in animal fats. In addition, non-organic meat also contains antibiotics and growth hormones that are administered to livestock on a regular basis. That is not only bad for your personal health, but the daily use of antibiotics in animal feed breeds antibiotic-resistant bacteria. The medical community is very worried about a looming health crisis when antibiotics will not work anymore to cure human illness. So where do you look for healthy food? 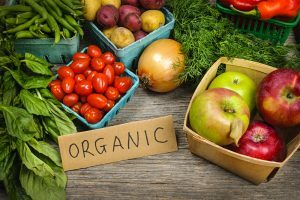 Organically grown food is healthier for you than non-organic food, and organic agriculture is good for you and good for the environment. Organic food is generally more expensive than commercially grown food because it involves more human labor. But when you eat organically grown food, you avoid the numerous toxic chemicals that are applied in “commercial” production. Moreover, organically grown food preserves the soil, reduces water pollution, and provides healthy habitat for wildlife, including threatened pollinators and amphibians. It also provides healthy jobs where farm workers are not exposed to large doses of chemicals.